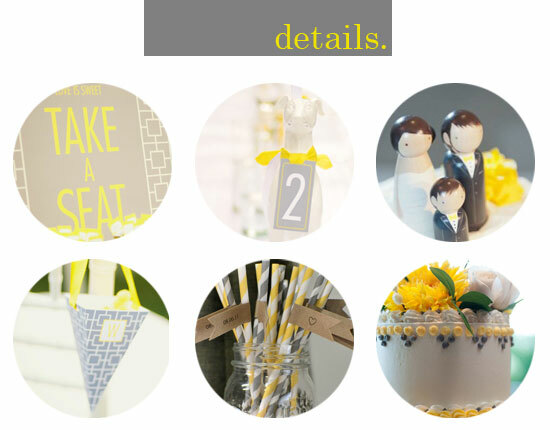 It's no secret that yellow and grey is trending in big ways in weddings. Brides are using this playful and modern combination in a variety of ways - in their stationery, flowers, bridesmaids dresses and décor. Here are are top ways of incorporating this divine palette into your special event. 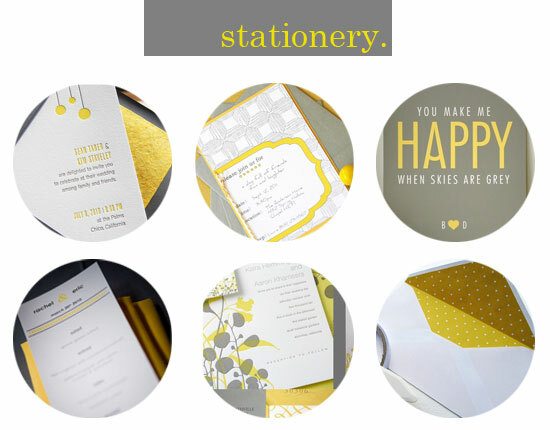 This palette is best served on stationery that is simple and chic. Use typography as your main graphic element and keep any shapes that you bring in simple and bold - do this right, and this palette will do the rest. This is such an easy palette to make effective. We love the paper crepe balls in the top left corner, and how simple, chic and modern do the chain paper links look? A simple bright linen napkin, or yellow flowers scattered along the aisle are simple but powerful ways to make the best of these colours. 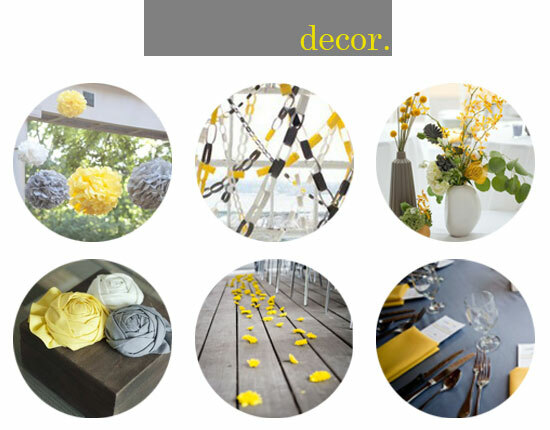 Yellow flowers are always cheerful and the obvious choice for this palette. If you don't fancy the all-yellow look, consider incorporating some paper flowers (top right) or some grey-tinged succulents (bottom right). 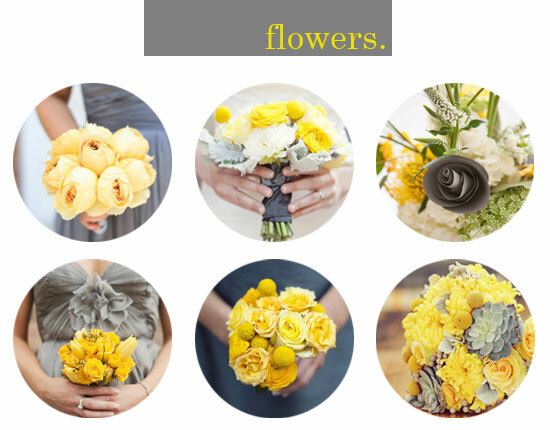 You can also incorporate grey into your bouquet by wrapping it in some satin (top middle). Bridesmaids dresses aren't the only way of bringing this palette into your wedding - think of your groom's boutonnières, or how about some colourful socks? 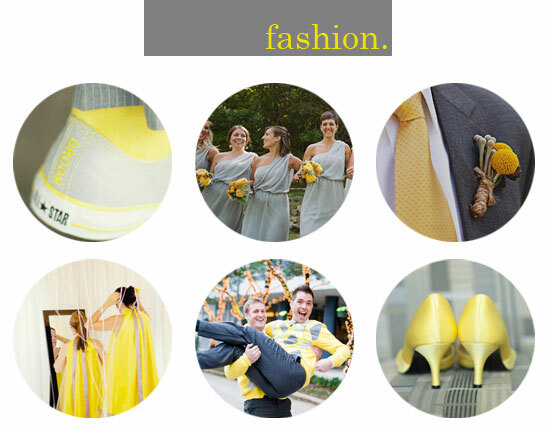 Yellow heels are great for a statement piece in your outfit and we love these argyle grey and yellow jerseys (bottom middle) for the groomsmen! Weddings are made up of the tiny details and these are the real chances of really embedding your theme into your event. We love these cute striped straws, and the cake detail. This theme was brought through on seating charts and table numbers too - stunning! We love doing inspiration boards - and we'd love to do some for you too! So if you are battling to bring a concept together or you just love the the idea of a certain theme or colour palette, facebook, tweet or email us a request for a mood board - we'd be happy to design one just for you!